Successful database projects are 50% about people, 30% process, and 20% technology: so why do so many projects have such a high budget on technology and such a low budget in comparison on people and processes? Why are these ratios important? Well, there is no point in just buying a database and that’s all – it won’t install itself, it won’t configure itself and it won’t know how to manage your processes on it. And yes your staff and the CRM supplier can do that, but in order to do so they will need time, resources, maybe back-filling of existing roles and so on. Of course, the database is not unimportant, but there are other factors which are more important in terms of ensuring successful usage and implementation of databases. I.e. If the data is not clean, useful and comprehensive then it doesn’t matter how good the hardware or database software is; if staff are not trained and business processes put in place, then, again, even the best database may struggle to correct such issues; and so on. And for implementations of new databases in particular, the need for project management cannot be underestimated, nor the influence and importance that the data migration will have on at least the initial go-live period of any new system. Whether or not the specific figures detailed at the start of this post are always exactly this ratio, they show the correct approach. So do take this into consideration when you are budgeting for your new database. With some of the CRM systems available now, where software licenses are reducing in cost and where hosting is offering good cost-benefits, you might find you can spend appropriately more easily on people and processes. But even if you don’t find yourself in that situation then do review your budget and ask yourself if it is definitely correct. I understand it is sometimes far more difficult to ask for money for spending on the people and processes when the software and technology appears to many senior managers at charities to be what you are really buying, but fight your corner and explain how important the other two factors are. Successful projects and procurements work because wise organisations understand this ratio is critical. 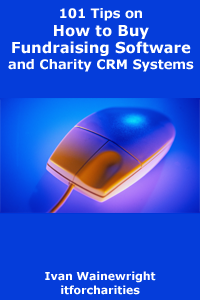 This is just one tip taken from my ebook, "101 Tips on How to Buy Fundraising Software and Charity CRM Systems". Also now available on Amazon. Spot on Ivan, I think over the years so much money has been spent on the actual software and set up of the software that it leaves little for making sure the people really know what to do. Obviously I've got a vested interested but I really believe the newer, more modern systems are much more human-focused in their design and the cost to get up and running (system-wise) so the money is directed into the business processes and people. It might not always cost much less overall to get there but the end result should be better - and not just for the lucky few there when the system went in, the next generation of staff in the organisation too. The issue with this is that the software manufacturer often state that the services should be equal or less than the software, or our software is so "user friendly" that all you have to do is watch the video. With that as the back drop to the implementations, its small wonder that the customer is confused and spends the money in the wrong place. Yes you are right richard, Better they can ask in internet or to some body before investing the money in a wrong company. I think you are right Ivan in what you are saying. We are now implementing projects where the implementation is done with a team of super users at the organisation. This gives them the ability to take charge of their own system for set-up and ongoing changes and allows them to react to business changes when they happen. This also contributes towards having their staff on board alot quicker.